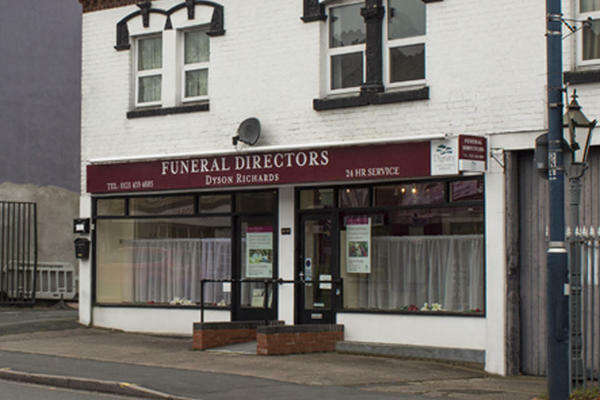 Dyson Richards Funeral Directors in Stirchley, Birmingham, have provided the highest standards of funeral care since 1901. We believe that life with those we love is deeply personal, and that a funeral should be no different. That is why we want to make sure your loved one receives a funeral befitting them, meaningfully celebrating their life. Whether you feel a religious or non-religious ceremony would be most fitting for your loved one, or if you would prefer a woodland burial or colourful celebration, we will be able to help you. Our funeral professionals have extensive knowledge and expertise conducting all kinds of funerals, so we will be able to help you no matter what you have in mind. We offer you our full support. If you need any advice or guidance, you can rely on us. We are never more than a phone call away, so please call us at any time that suits you. You can reach us 24 hours a day. Call us today on 0121 459 4885 to talk through your personal requirements. At Dyson Richards Funeral Directors, we understand how special life is with those that you love. For us, every funeral is unique and personal. We have a service to fulfil every wish, with every detail carried out with the same uncompromising quality of care. From a traditional service, to a colourful woodland burial, your options are limitless with our Full Service Funeral. If you have a little more flexibility when it comes to arrangements, then we can provide a Simple Funeral for a lower cost. There is free parking available at the rear of the funeral home. We are opposite the junction for Twyning Road. Our staff are available 24 hours a day on 0121 459 4885 if you require our services outside of these hours. I would have preferred it if you were open later because closing at 12 is just not good enough.we felt that we had to view my mom earlier in the day as we would have liked. I've still not received a call to say my mom's ashes are ready. Thank you for your 4 star review. We will be in contact as discussed, to address your concerns. Very high standard of service before during and after funeral.